Move over trust falls and ropes courses, turns out playing video games with coworkers is the real path to better performance at the office. A new study by four BYU information systems professors found newly-formed work teams experienced a 20 percent increase in productivity on subsequent tasks after playing video games together for just 45 minutes. The study, published in AIS Transactions on Human-Computer Interaction, adds to a growing body of literature finding positive outcomes of team video gaming. For the study, researchers recruited 352 individuals and randomly organized them into 80 teams, making sure no participants with pre-existing relationships were on the same team. For their initial experimental task, each team played in a geocaching competition called Findamine, an exercise created by previous IS researchers which gives players short, text-based clues to find landmarks. Participants were incentivized with cash rewards for winning the competition. Following their first round of Findamine, teams were randomly assigned to one of three conditions before being sent out to geocache again: 1) team video gaming, 2) quiet homework time or 3) a “goal training” discussion on improving their geocaching results. Each of these conditions lasted 45 minutes and those in the video gaming treatment chose to play either Rock Band or Halo 4 — games selected because they are both familiar and require coordinated efforts among players. The researchers found that while the goal-training teams reported a higher increase in team cohesion than the video-gaming teams, the video gamers increased actual performance on their second round of Findamine significantly, raising average scores from 435 to 520. 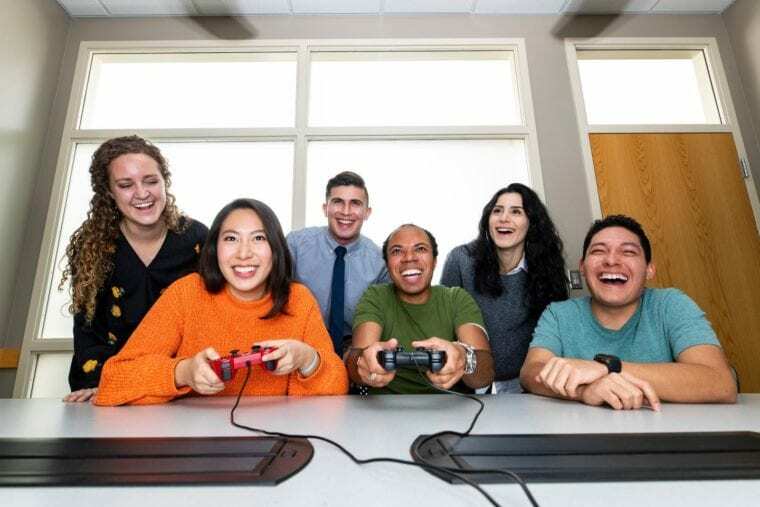 “Team video gaming may truly be a viable — and perhaps even optimal — alternative for team building,” said lead researcher Mark Keith, associate professor of information systems at BYU. Researchers also said it doesn’t matter if people are avid video gamers to see the positive effects of gaming together; they observed video game novices established communications norms — and built working relationships — even quicker with new teammates so as to learn the nuances of the game. There is one caveat to the finding, however: the study was done with teams of individuals who don’t know each other. Researchers admit If team members are already familiar with each other, then competitive video gaming may possibly reinforce biases and negative relationships developed from previous experiences. Co-authors on the study also included James Gaskin and Douglas Dean, both faculty of the BYU Information Systems Department in the Marriott School of Business. The group of researchers are now looking at the varying level of influence of competitive and non-competitive games on team building.